does anyone knows what the problem is? if so, would lowering the torque from 0 - 2000 rpm will get me a better fuel efficiency? BMW 5 series in manual transmission?? That’s very very rare in Singapore. Hello. welcome. for your info this is a Singapore car forum, hence many topics are linked to singapore. regarding your concern on the torque, you can see from the torque lines (orange lines that looks like an inverted "V") that the before and after is different only at 2000rpm. the torque before 2000rpm is the same as stock. Therefore, your suggestion of "lowering the torque from 0 - 2000 rpm" will not change anything. 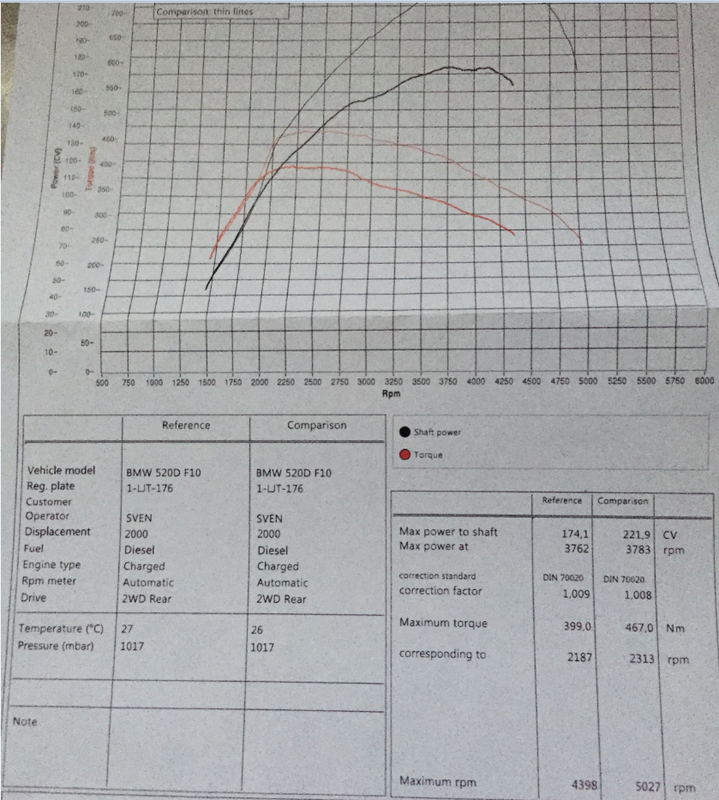 regarding yoru concern on mpg decreased after ecu remap. 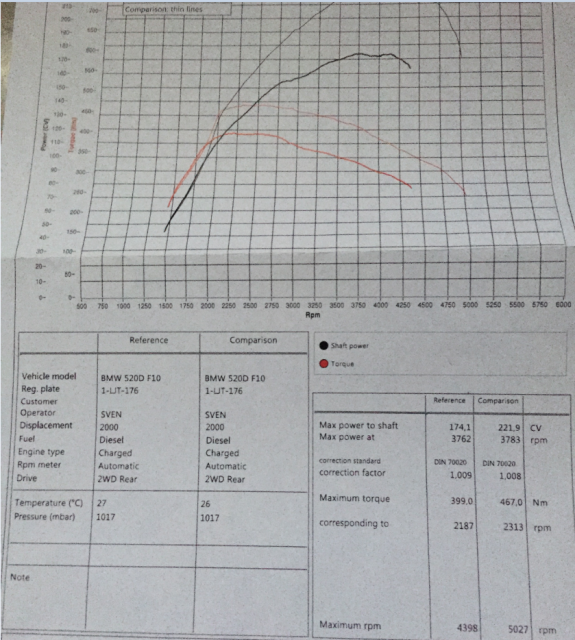 ecu remap isn't some magic of just changing your torque vs rpm graph. it requires changing parameters such as ignition timing, fuel injection timing and cycles, fuel pressure, throttle input maps, torque limiting map, turbo boost etc. increasing torque can be as simple as removing the torque limiting map (though it's always not so simple). In your case, I don't know what the tuner did, but he might have adjusted fuel injection, fuel pressure and ignition parameters on top of the torque limiting map. Because those are changed, it affects your engine performance at all rpms, so driving around town will give you lower mpg than normal. regarding your REAL problem "when driving in town i can see the km range drop every 5 - 10 seconds by 1 km" , this is not a problem. every car experiences the same thing, and it has nothing to do with your ecu remap. the 250km range shown on your car is just an estimate calculated by the computer based on an averaged city/highway driving. if you drive around town, the car consumes more fuel due to idle and low speed driving, so of course the range estimated by the computer will keep decrease. when driving on the highway, the car consumes less fuel, so it is only normal that you will get "better" driving range. it's not technically better, because that's what the car can do originally. you only think it's better because of what the ecu tells you before. Edited by Ishiwgao, 29 October 2018 - 05:58 AM. should i go back to the tuner and ask him if he can finetune the remap so i get normal mpg driving in town? Edited by QiQiDude, 29 October 2018 - 06:37 AM. Most of the time, tuning the Ecu is a zero sum game unless you have upgraded components added. Almost all of the time, car manufacturers would have already spent hundreds if not thousands of manhours tuning and refining the Ecu maps of each model before releasing it. What you can achieve out of tuning the stock factory car is to achieve certain driving characteristics eg. More low end torque but that will usually means at higher end you might loss power. Something's gotta give. For driving around town, 467nm of torque arriving at 2k rpm is overkill and waste of fuel as you will just be burning up fuel at faster rate for the kind of acceleration you don't need around town. Something's gotta give... And in this case is your fuel consumption. I cant go back and ask him to finetune the remap? Like more mpg for mayby less power? should i ask him to finetune all the things that ishiwgao said like changing the parameters such as ignition timing, fuel injection timing and cycles, fuel pressure, throttle input maps, torque limiting map, turbo boost etc. What would you guys ask him? Edited by QiQiDude, 29 October 2018 - 08:38 AM. You want more power, you consume more fuel. Then why you want to remap the ECU in the first place?? Should have leave it as stock if you want less power and more mpg isn't it?? I believe the root of the issue lies with the engine. Nothing to do with the tuning. Usually for diesel engine the most common issue is with the high pressure fuel pump, the fuel rail and fuel injectors. Have all these items overhauled and cleaned before you do your tuning. you should be able to ask him to fine tune the remap, but it's gonna cost you more money. also, if you dont have a deep understanding of ecu remapping, i suggest you don't act smart and ask your tuner about ignition timing, fuel injection etc. it'll only make you look like a fool in front of him, and considering he's done this work for 20 years, he might just become mad at you. as what bro Kb27 said, there is no free lunch. you wanted more power, you get less mpg. since you asked the tuner to push it to the limits, this is your result. you can probably ask him to tune it down a bit to get more mpg, but the result may not be as you expect. it may not even go back to normal (ie, before the tuning). ecu remapping is a complicated business, where big companies spent much money on. one guy/a few guys are not going to be able to do what thousands of people have done. hard truth, sorry to say. You are quite a funny and innocent lamb. You expect to tune up the car big time and maybe save more fuel? If there was such a good way, BMW would have done it for you already. When you go to a tuner, you must tell him what you want. Some ask for more torque for better drivability. Some ask for better fuel efficiency. In your case, you got what you wanted when you told him to just push it to it's limit which means maximum horsepower. edit: just to be sure, im not screwed right? it's not like im stuck in this situation i hope? Edited by QiQiDude, 31 October 2018 - 01:39 AM. i am sure it is just your imagination about the MPG. it should be the same as before. just that after your remapping you now pay more attention and start to tell yourself things. Ppl who does ecu remapping but don't bother to do some reading and expect their car to perform to their expectations. The so called engine tuning or ecu remapping, (assuming there's no hardware changes done on your engine) isn't going to give you a "kick" in your back or will give you excellent fuel economy. Anyway it don't make sense if after tuning your car's engine is going to give better fuel economy and better performance at the same time. You see gains after tuning because the factory tune is to meet emission standards, fuel economy and engine reliability. Your engine's potential is held back for that 3 reasons. After the engine's potential has been "unlocked" the tuner will do the engine tuning by adjusting the mapping parameters. So what exactly does the tuner do? I use the torque curve to explain. It's easier that way. This is what he will do. 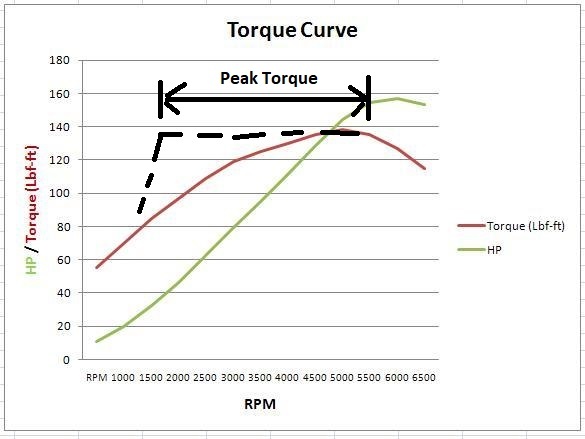 Adjust the torque curve that originally looks like a "hill" and change it to look like a "plateau". Adjust the "plateau" to stretch as far as possible. 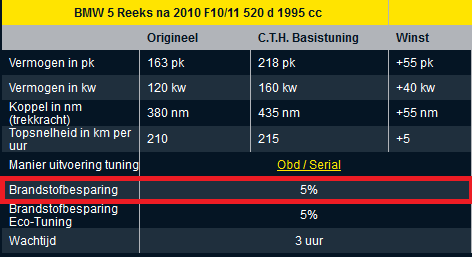 So that you will have peak torque in almost every engine rpm. I randomly took this pic online and modify in black to show as an example. This is why they call it ecu remapping. If you have not done any significant engine modification before/after your engine tuning your fuel economy should not change drastically. That's why I say in my first post it has nothing to do with the tuning and the issue lies with your engine. Most likely the diesel delivery system. For a turbo diesel engine its performance and fuel economy largely depends on its fuel delivery system. If it's clogged with carbon or the seal kit for the high pressure fuel pump needs to be replaced you will see your engine performance and mpg suffer. Simple as that. Edited by Watwheels, 31 October 2018 - 11:56 AM. was it be better if i had chosen that one instead of just asking for max engine power? did the system had to adjust or something? Edited by QiQiDude, 02 November 2018 - 07:42 AM.